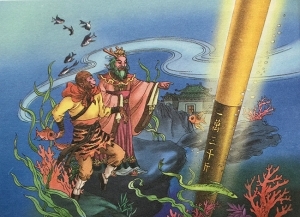 One of the most beloved episodes from the classic Chinese novel Journey to the West is the tale of Monkey King and Princess Iron Fan. Filled with humor and trickery, it has delighted generations of readers and been adapted and retold in many forms, including now on the Shen Yun stage. We join our heroes (Monkey, Pigsy, Sandy, and Tang Monk) heading westward to obtain Buddhist scriptures to bring back to China. Already weary from ages of hard walking, they begin noticing the ground beneath their feet (and paws or trotters, depending) growing hotter and hotter. When it becomes unbearable to continue, they arrive at the source of the heat: a mountain range ablaze with unceasing flames that fill the sky and blister the earth. 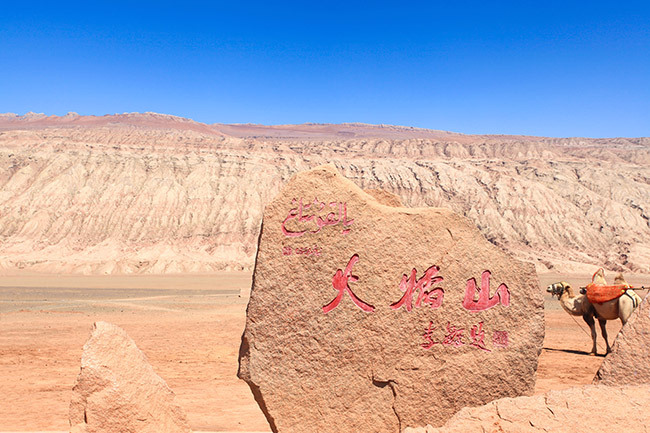 rim of the Taklamakan Desert in Xinjiang Province. Nothing can grow in the vicinity of Fire Mountain, and crossing through it is clearly out of the question. The local Deity of the Earth who resides nearby emerges to inform the travelers that these flames could be extinguished with the right tool: the Iron Fan. This is the most treasured item of an immortal princess, who lives in the lush and cool Plantain Cave some distance away. With just a few waves, her magical fan could put out the mountain’s blazes forever. Bidding the others a quick farewell, Monkey sets off to borrow the magical fan. With such a noble pilgrimage at stake, who could refuse to lend even their most precious possession? As it turns out, Princess Iron Fan could. Still harboring a grudge from a previous encounter, she gives Monkey a tepid reception and tries to fool him with a decoy fan. Incensed, Monkey demands the real fan. So the princess obliges him. She pulls out her magic treasure and promptly gives him a demonstration of its powers—fanning Monkey into oblivion with one grand sweep. She considers the matter suitably settled. Round one: Princess Iron Fan blows Monkey away. Woven from palm leaves and imbued with mystical powers, the Iron Fan can send the princess’s enemies 80,000 leagues through the air. But being rather magically marvelous himself, Monkey is swept only 50,000 leagues away. Vexed at this setback, he cries out in frustration. But fortunate for Monkey, he lands on a mountain that is home to a familiar bodhisattva. The goddess greets Monkey, and on hearing our heroe's plight, gifts him a magical orb (the Wind-Fixing Pill). This ball will prevent the princess’s fan from blowing him away even an inch. Monkey thanks the deity and springs back into action. With one super somersault, he flies back to Plantain Cave and makes an explosive entrance. What began as a tense and banter-filled standoff now turns into an all-out brawl. Monkey plucks a few golden hairs from his head and transforms them into monkey clones to help him battle the princess’s underlings. 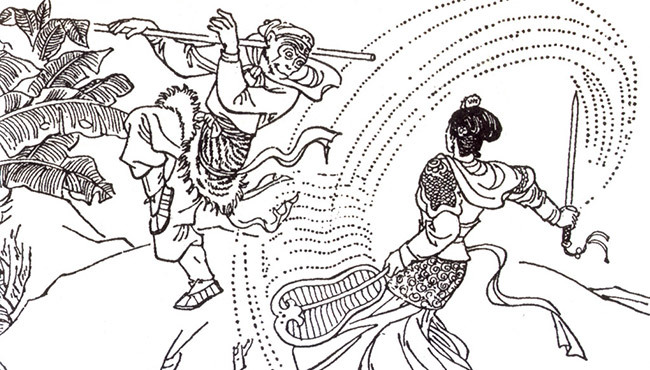 The princess enters the fray with twin swords, before realizing their vulnerability against Monkey’s golden staff and resorting back to her Iron Fan. 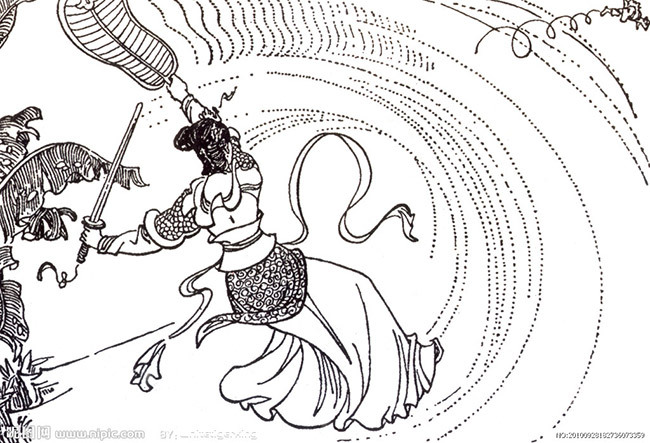 But this time, no matter how hard she swooshes, Monkey is protected by the Bodhisattva’s orb and doesn’t budge. Overwhelmed, Princess capitulates and hands over her treasure. Finally, Monkey flies back to his still-scorching Master Tang Monk and brethren at the foot of Fire Mountain. True to repute, a few waves of the supernatural fan extinguish the mighty flames. Our heroes continue on their sacred journey westward, but not before returning the treasure to its owner. And for her part, Princess Iron Fan would go on to quench the anger in her heart and dedicate herself to her own spiritual cultivation journey. Eventually, she too obtains enlightenment. 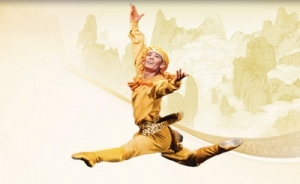 The Shen Yun 2017 dance drama has adapted this episode of Journey to the West for the stage in length, number of characters, and sheer amount of Monkey shenanigans.